BLyS and APRIL are two members of the TNF superfamily that are secreted by activated myeloid cells and have costimulatory activity on B cells. BLyS and APRIL share two receptors, TACI and BCMA, whereas a third receptor, BAFF-R, specifically binds BLyS. Both BLyS and APRIL have been described as homotrimeric molecules, a feature common to members of the TNF superfamily. In this study, we show that APRIL and BLyS can form active heterotrimeric molecules when coexpressed and that circulating heterotrimers are present in serum samples from patients with systemic immune-based rheumatic diseases. These findings raise the possibility that active BLyS/APRIL heterotrimers may play a role in rheumatic and other autoimmune diseases and that other members of the TNF ligand superfamily may also form active soluble heterotrimers. The TNF superfamily of ligands and receptors is known to play a crucial role in the regulation of inflammation and immune responses (1). Two members of the TNF superfamily of ligands, APRIL and BLyS (also known as BAFF, THANK, TALL-1, and zTNF4; Refs. 2, 3, 4), exhibit overlapping features. They are both mainly expressed by myeloid cells, they have been reported to act as costimulatory B cell factors, and they share two receptors, TACI and BCMA (5, 6, 7, 8, 9, 10). A third receptor, BAFF-R (also known as BR3), has recently been cloned and appears to be specific for BLyS (11). The expression of these receptors appears to be restricted mainly to B and, to a lesser extent, T cells. BLyS has been shown to be a central regulator of B cell survival. BLyS-deficient mice (12, 13) show normal B cell development in the bone marrow and early T1 B cells in the spleen, but lack all other peripheral B cell subsets. Conversely, deregulation of BLyS expression has been associated with the development of autoimmune diseases. BLyS transgenic mice have an elevated number of circulating B cells, harbor elevated serum titers of autoantibodies, and develop a systemic lupus erythematosus (SLE)3-like syndrome (6). In humans, elevated serum BLyS levels have been found in SLE, rheumatoid arthritis (RA), and Sjögren’s syndrome patients (14, 15, 16), suggesting that abnormal B cell activity seen in these conditions may, at least in part, be due to BLyS. In contrast to BLyS, the role of APRIL is less clear. Some investigators have shown that APRIL may act as a costimulator for T and B cell activation and as an inducer of tumor cell growth (17), while others have shown it can function as a proapoptotic factor (18). The role of APRIL in autoimmune disease remains to be determined. TNF ligands have been shown to form trimeric structures composed of three monomers (1). It was initially proposed that ligand homotrimers would cause trimerization of their receptor, but recent studies (19) point to the existence of preassembled receptors. Furthermore, new findings suggest that BLyS may form very large virus-like structures composed of multiple homotrimers (20). This cluster formation is mediated by a “flap” region that is not present in APRIL. How these large oligomers would interact with their receptors has yet to be elucidated. These results are not consistent with two other reports that found that BLyS exists only as a trimer and not as an oligomer (4, 21). Even though most ligands of the TNF superfamily are known to be homotrimers, heterotrimeric molecules have been described. LTα and LTβ can form two types of membrane-bound complexes: LTα1β2 and LTα2β1, which bind different receptors (LTβR and TNFR1/2, respectively; Refs. 22, 23, 24). Based on the phenotype of LTα transgenic and LTβ null mice, it appears that LTα-induced inflammation is primarily due to interaction of the LTα3 homotrimer with TNFR1, whereas the LTα1β2 heterotrimeric complex plays an important role in lymphoid organ development. While investigating the regulation of APRIL and BLyS expression in autoimmune diseases, we identified two BLyS-binding mAbs that detected different levels of BLyS in autoimmune serum samples, but recognized recombinant human BLyS equally well. This observation suggested that BLyS might exist in alternative forms in human serum and prompted us to evaluate whether, like LTα and β, BLyS might form heterotrimers with its close homolog APRIL. In this study, we show that APRIL and BLyS, when coexpressed, can indeed form biologically active heterotrimeric complexes that circulate in the serum of patients with systemic immune-based rheumatic diseases. The genes encoding full-length recombinant BLyS, APRIL, and FLAG-tagged BLyS were cloned into the mammalian expression vector pEE12.1 (Lonza Biologics, Slough, U.K.) using appropriate restriction sites. DNA prepared from each construct was cotransfected into HEK 293T cells by transient transfection using Lipofectamine (Invitrogen, San Diego, CA) and the cell culture supernatant harvested 3 days posttransfection. Immulon-2 plates (Dynex, Chantilly, VA) were coated by dispensing 100 μl of capture Ab solution (3 μg/ml in PBS) into individual wells followed by overnight incubation at 4°C. The next day the coating solution was removed, plates were washed two times with PBS, and blocked by incubation with 200 μl of blocking buffer (PBS, 3% BSA) for 2 h at room temperature. For expression analysis, serial dilutions of cell supernatants were prepared in diluent buffer (PBS, 0.1% Tween 20, 0.1% BSA) and dispensed into individual wells of Ab-coated plates. The plates were incubated for 2 h at room temperature. Plates were washed four times with PBS Tween, 100 μl of the biotinylated detection Ab (0.25 μg/ml in diluent buffer) were added to each well and plates were incubated for 2 h at room temperature. After washing, streptavidin-peroxidase conjugate (Vector Laboratories, Burlingame, CA) was added (0.25 μg/ml in diluent), plates were incubated for 1 h, and after washing, the peroxidase reaction was developed with the TMB substrate kit (Sigma-Aldrich, St. Louis, MO). Light absorbance was measured at 450 nm using SpectraMax 3000 plate reader (Molecular Devices, Sunnyvale, CA) and dilution curves were generated in coordinates OD450 sample dilution. For quantitative analysis of serum from normal donors and patients, a set of appropriate standards (BLyS, APRIL, or BLyS/APRIL heterotrimer) was prepared and processed along with serum samples in the same manner as described above. mAbs against BLyS and APRIL were generated using standard hybridoma technology. BALB/c mice were given a s.c. injection of 50 μg of the correspondent recombinant protein in CFA (Sigma-Aldrich), followed by three additional injections of 25 μg of the same protein in IFA at 2-wk intervals. Two weeks later, an i.p. injection of 25 μg of the protein in PBS was given, mice were sacrificed 4 days later, and splenocytes were harvested for fusion. Splenocytes from one spleen were fused with 2 × 107 P3×63Ag8.653 plasmacytoma cells using PEG 1500 (Boehringer Mannheim, Indianapolis, IN), according to a manufacturer modification of an earlier described method (25). After fusion, the cells were resuspended in 400 ml of hypoxanthine/aminopterin/thymidine medium, containing 20% FBS, 4% of Hybridoma Supplement (Boehringer Mannheim), and distributed into 96-well plates for selection. Two weeks later, hybridoma supernatants were screened for specific Abs using solid-phase ELISA on Ag-coated plates. Top binders were identified by an ELISA modification of an affinity ranking procedure described elsewhere (26), and after two rounds of cloning by limiting dilutions, the corresponding hybridomas were expanded in ascites in syngenic mice. The Abs were affinity purified on a Protein A column (HighTrap; Amersham Pharmacia Biotech, Piscataway, NJ). The B3-specific Ab was generated by phage display technology using a human single-chain variable fragment (scFv) phage display library (27). The lead scFv was isolated by panning the library on immobilized BLyS. The binding specificity was confirmed by phage ELISA on BLyS-coated plates as described elsewhere (28). The VH and VL genes from the scFv were converted to full-length γ1 and κ formats using, correspondingly, the pEU1 and pEU3 vectors (Cambridge Antibody Technology, Cambridge, U.K.) according to a procedure described by Persic et al. (29). The resulting constructs were expressed in HEK 293T cells and the Ab purified from the culture media on a Protein A column. Rabbits were given a s.c. injection of 100 μg of the BLyS or APRIL recombinant protein in CFA (Sigma-Aldrich), followed by several boosts of 50 μg in IFA at biweekly intervals. After the second boost, serum samples were analyzed for specific Ab titers by solid-phase ELISA on Ag-coated plates. After an additional boost, serum titers were high enough, serum was collected and pooled, and the Abs were purified by affinity chromatography using Affigel-10 columns (Bio-Rad, Hercules, CA) with immobilized BLyS or APRIL. Supernatants (500 μl/IP) from transiently transfected HEK293T cells were immunoprecipitated using 1 μg of the indicated Abs and 50 μl of protein A or protein G Sepharose for 2 h at 4°C. The beads were then washed three times with ice-cold wash buffer (10 mM Tris (pH 7.5), 150 mM NaCl, 2 mM EDTA, 0.875% Brij 96, 0.125% Nonidet P-40, 1 mM Na3VO4, 5 mM NaF, 10 μg/ml each of leupeptin and aprotinin) and resuspended in Laemmli sample buffer. Proteins were separated on a 10–20% SDS-PAGE gradient gel, transferred to polyvinylidene fluoride membranes (Immobilon-P) and Western blotted using 1 μg/ml of the indicated pAb in 3% milk-PBS-T (PBS containing 0.2% Tween), followed by a secondary donkey anti-rabbit HRP-conjugated secondary Ab. Western blots were visualized by ECL (Pierce, Rockford, IL). Human tonsillar B cells were isolated by Ficoll centrifugation followed by negative selection using MACS magnetic beads (Miltenyi Biotec, Auburn, CA). Spleen cells were isolated from 6- to 10-wk-old female BALB/c mice by Ficoll centrifugation. B cell proliferation was assessed in the presence of Staphylococcus aureus cells (1/100,000 final dilution; Pansorbin; Calbiochem, La Jolla, CA) and protein concentrations ranging from 90 ng/ml to 0.01 pg/ml. Cells were resuspended at 1 × 105/well in a final volume of RPMI 10% FBS containing 1 × 10−5 M 2-ME, and incubated in the presence of the indicated factors for 72 h. The cells were then pulsed with 0.5 μCi/well of [H3]thymidine for another 20 h. Incorporation of thymidine was used as a measure of cellular proliferation. For Ab or receptor (Fc fusions) inhibitions, cells were incubated in the presence of 3 ng/ml of either BLyS or APRIL/BLyS heterotrimer, and neutralizing activity was tested at concentrations ranging from 10 μg/ml to 100 pg/ml (six 10-fold dilutions). Three affinity columns with immobilized anti-BLyS homotrimer (B3), anti-APRIL homotrimer (A3), or anti-HT Ab were prepared in a similar way. A total of 10 mg of the Ab in 20 ml of PBS were mixed with 10 ml of preactivated AffiGel 10 (Bio-Rad) in 50 ml blue cup tube (Falcon; BD Labware, Franklin Lakes, NJ) and rotated overnight at 4°C. The gel was packed on the next day into a 10-ml column (Kimble/Kontes, Vineland, NJ), washed twice with 0.1 M Glycine-HCl (pH 2.5), and equilibrated with PBS. Supernatants from transfected NSO cells were concentrated by tangential flow filtration on Pellicon XL (Millipore, Bedford, MA) using a membrane with the cut-off limit 10 kDa. The concentrated material (30–50 ml) was applied to an affinity column with immobilized anti-A3 Ab at a flow rate of 0.3 ml/min. The absorption cycle was repeated two more times. The column was regenerated between cycles by elution of the bound material with 0.1 M glycine-HCl (pH 2.5) and reequilibration with PBS. The same three absorption cycles were repeated on a column with immobilized anti-B3 Abs. The flow-through after the last absorption cycle was then applied to a column with immobilized anti-HT Ab. The column was extensively washed with PBS and the bound BLyS/APRIL heterotrimer was eluted with 0.1 M Glycine-HCl (pH 2.5). The eluted material was immediately neutralized with PBS, aliquotted, and kept frozen at −80°C. Patients admitted to the Los Angeles County and University of Southern California Medical Center and seen in consultation by the Rheumatology Service or patients receiving out-patient medical care at the Rheumatology Clinics of Los Angeles County and University of Southern California Medical Center (Los Angeles, CA) or the Edward R. Roybal Comprehensive Health Center (Los Angeles, CA) were recruited for this study. No exclusions were made on any basis other than an inability to give informed consent. Diagnoses were based on established clinical criteria (30). After obtaining written informed consent, venous blood was collected by venipuncture, permitted to clot, and stored at −70°C until shipment to Human Genome Sciences (Rockville, MD) on dry ice by overnight carrier for serologic evaluation. To address whether both APRIL and BLyS are up-regulated in disease, we generated a panel of BLyS- and APRIL-specific mAbs and pAbs to use as ELISA capture and detection reagents, respectively. Samples collected from normal donors and from patients with systemic immune-based rheumatic diseases were analyzed. For BLyS, two ELISA formats were tested: two different mAbs to BLyS were used as capture reagents, while the detection reagent was, in each case, a pAb to BLyS. We found that while the two capture mAbs were able to recognize recombinant BLyS in a similar fashion, as shown by their standard curves (Fig. 1⇓A), the mAb2 consistently detected higher levels of BLyS in both normal and patient samples (Fig. 1⇓B). 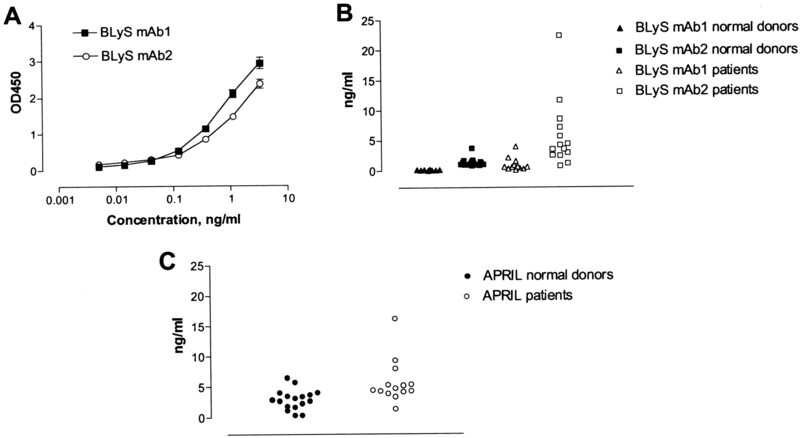 We also analyzed the same samples for APRIL expression and found that APRIL was slightly up-regulated in patient samples compared with normal donors (Fig. 1⇓C). The fact that the mAb2 to BLyS detected higher levels of protein in both sets of samples suggested two possibilities: 1) that this Ab cross-reacted with APRIL, and was detecting both B3 and A3; 2) that this Ab was recognizing another form of BLyS, in addition to the described homotrimeric molecule. The fact that APRIL and BLyS are secreted by the same cell types in response to similar types of stimuli and that they share the use of two receptors prompted us to ask whether they could form heterotrimeric molecules, composed of one APRIL molecule and two BLyS molecules (AB2) or two APRIL molecules and one BLyS (A2B), in addition to the known homotrimeric complexes. The discrepancy in the results observed between the two ELISA formats could be explained if these heterotrimeric forms of APRIL and BLyS did indeed exist and only mAb2 were able to recognize them. BLyS and APRIL expression in normal and autoimmune samples. A, Standard curves for mAb1 and mAb2; B, ELISA analysis using mAb1 and mAb2 to BLyS; and C, ELISA analysis using a mAb to APRIL. To analyze whether APRIL and BLyS could form heterotrimeric complexes (designated as HT, while BLyS and APRIL homotrimers are designated as B3 and A3, respectively), and to rule out that the differences observed with the two mAbs were not due to cross-reactivity with APRIL, we first transiently expressed full-length APRIL and BLyS cDNAs, alone or in combination, in HEK293T cells. Supernatants from these cells were collected and analyzed by immunoprecipitation and Western blotting using a panel of Abs. We first immunoprecipitated the supernatants with the two mAbs that we had previously characterized as able to bind recombinant BLyS, and Western blotted the membrane with either a pAb to BLyS or one to APRIL (Fig. 2⇓). We found that the first Ab (mAb1, designated as anti-B3) was able to efficiently immunoprecipitate homotrimeric BLyS (Fig. 2⇓B, lane 2, third panel), but APRIL was not coimmunoprecipitated when the two molecules were coexpressed (Fig. 2⇓A, lane 2, fourth panel). In contrast, the second Ab (mAb2, designated anti-HT) was able to immunoprecipitate a complex in which both molecules were present (Fig. 2⇓A, lane 4, fourth panel) in addition to immunoprecipitating the B3. The fact that this Ab was not able to immunoprecipitate APRIL when expressed in the absence of BLyS (Fig. 2⇓A, lane 4, second panel) suggests that its ability to detect higher levels of BLyS in human serum samples was not due to cross-reactivity with APRIL or to nonspecific binding. A similar analysis was performed by immunoprecipitating with an mAb to APRIL (designated anti-A3) or with a pAb to APRIL, followed by Western blotting analysis of the membranes with a pAb to BLyS. The mAb anti-A3 only weakly detected the heterotrimer, but specifically recognized the homotrimeric APRIL molecule (Fig. 2⇓, A and B, respectively, lane 6, lower panels), while the pAb efficiently isolated both the homotrimeric APRIL and the heterotrimeric APRIL/BLyS molecules (Fig. 2⇓, A and B, respectively, lane 7, lower panels). Similarly, the polyclonal anti-BlyS Ab was able to recognize both homotrimer BLyS and the heterotrimer (data not shown). To rule out any nonspecific binding due to the use of polyclonal serum as an immunoprecipitating reagent, we performed a similar experiment using a FLAG-tagged form of BLyS (Fig. 2⇓C). 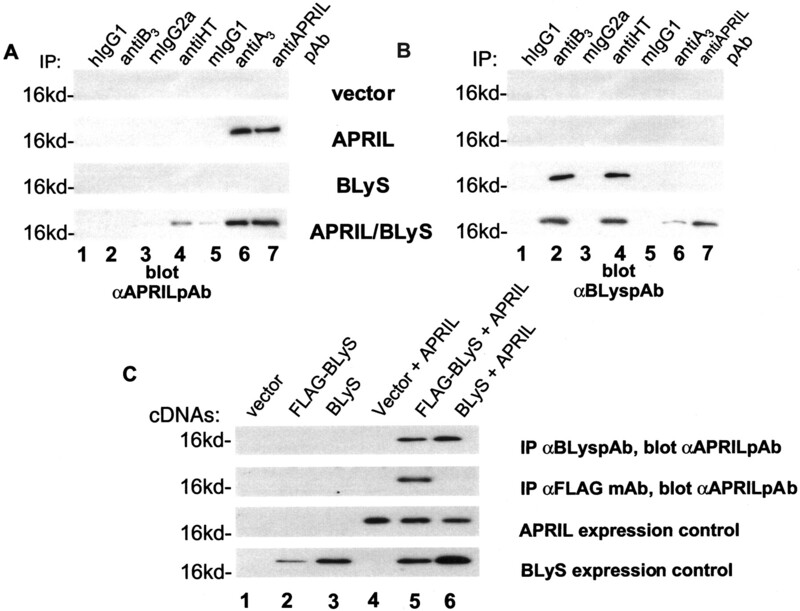 Immunoprecipitations with an anti-FLAG mAb followed by Western blotting with the anti-APRIL pAb, resulted in a specific coimmunoprecipitation of the FLAG-tagged form BLyS with APRIL, while no association was observed with the nontagged form of BLyS (Fig. 2⇓C, lanes 5 and 6, second panel). In contrast, immunoprecipitating with the anti-BLyS pAb resulted in coimunoprecipitation of both forms of BLyS with APRIL (Fig. 2⇓C, lanes 5 and 6, first panel). Coimmunoprecipitation of APRIL and BLyS in supernatants from HEK 293T cells. HEK 293T cells were transfected with cDNAs for vector control, APRIL, BLyS, or BLyS and APRIL. 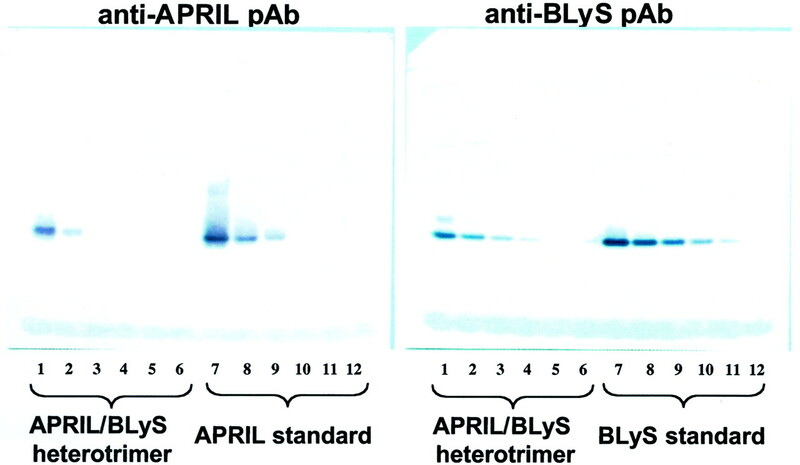 Supernatants were collected after 48 h and analyzed by immunoprecipitation with the indicated Abs followed by Western blotting with either anti-APRIL (A) or anti-BLyS pAbs (B). C, HEK 293T cells were transfected with the indicated cDNAs and supernatants were collected after 48 h and analyzed by immunoprecipitation with either the anti-BLyS pAb or an anti-FLAG mAb followed by Western blotting with the anti-APRIL pAb. The same set of supernatant samples was analyzed by ELISA using similar capture-detection Ab pairs. In the supernatant of cells transfected with APRIL alone or BLyS alone (Fig. 3⇓, A and B), the anti-A3/anti-APRIL pAb and the anti-B3/anti-BLyS pAb formats specifically recognized the homotrimeric form of APRIL and BLyS, respectively. None of the other ELISA formats detected significant levels of protein, indicating that there was no Ab cross-reactivity. In contrast, supernatants collected from cells coexpressing APRIL and BLyS, using the Ab that we had previously used to coimmunoprecipitate the two molecules as a capture reagent (anti-HT) and the polyclonal anti-APRIL Ab as a detector, we were able to detect significant levels of heterotrimer (Fig. 3⇓C). The polyclonal/pAb format appeared to be the most sensitive in recognizing heterotrimeric molecules (Fig. 3⇓C, ♦). The culture supernatant also contained high levels of A3 and B3 that were recognized by the anti-A3 and anti-B3 capture mAbs, respectively. ELISA analysis of supernatants from HEK 293T cells. HEK 293T cells were transfected with cDNAs for APRIL (A), BLyS (B), and BLyS and APRIL (C). Supernatants were collected after 48 h and analyzed using the indicated five different ELISA formats (capture Ab/detection Ab). Table I⇓ summarizes the binding characteristics of the mAbs and pAbs described. Having characterized three Abs that were able to recognize homotrimeric BLyS (anti-B3), homotrimeric APRIL (anti-A3), and the heterotrimeric molecules (anti-HT), respectively, we designed a purification strategy that took advantage of these features. Supernatant generated from a 200-ml culture of mouse myeloma NSO cells transiently transfected with APRIL and BLyS was first depleted of the two types of homotrimers (A3 and B3) by affinity purification using an anti-A3 Ab column, followed by an anti-B3 column. The flow-through material was then analyzed by ELISA (using specific anti-A3 or anti-B3 Abs) to confirm that the majority of homotrimeric BLyS and APRIL had indeed been removed (data not shown). The BLyS/APRIL heterotrimeric molecules were purified by absorbing the homotrimer-depleted material on an Ab column made with the anti-HT Ab followed by acidic elution. This material was analyzed by Western blot analysis and quantitatively compared with known amounts of the recombinant APRIL and BLyS protein standards (Fig. 4⇓). The heterotrimer standard appeared to be stable as the low levels of A3 and B3 did not increase over time. An ELISA analysis performed 6 mo after purification excluded the spontaneous reformation of B3 and A3(data not shown). Western blot analysis and B cell proliferation assay using purified heterotrimers. APRIL/BLyS heterotrimer was purified from supernatant derived from a stable clone of mouse myeloma NSO cells expressing APRIL and BLyS. Western blot analysis with anti-APRIL pAb (left panel) and anti-BLyS pAb (right panel) of the purified heterotrimer and APRIL and BLyS standards: lanes 1–6, heterotrimer (undiluted, 1/3, 1/10, 1/30, 1/100, 1/300); lanes 7–12, standards (3.0, 1.0, 0.3, 0.1, 0.03, 0.001 μg/ml). We then wanted to test the purified heterotrimers for their ability to induce B cell proliferation and to compare it to the recombinant homotrimeric forms of BLyS and APRIL (Fig. 5⇓). Although we have previously shown that BLyS is an extremely potent B cell costimulator, capable of inducing B cell proliferation at very low concentrations (2), in our hands, APRIL weakly induces B cell proliferation in the same range of concentrations (100 ng/ml to 0.2 pg/ml). However, the heterotrimer composed of APRIL and BLyS induced human and murine B cell proliferation at concentrations similar to those observed with recombinant BLyS (Fig. 5⇓, A and B). We then tested the set of mAbs that recognize either the homotrimers or the heterotrimers for their ability to inhibit BLyS or heterotrimer-induced human B cell proliferation. Anti-B3 efficiently neutralized BLyS-induced proliferation, but was not effective in inhibiting the activity induced by the heterotrimer (compare Fig. 6⇓, A and B). In contrast, the mAb recognizing both homotrimer BLyS and the heterotrimers (anti-HT) was able to inhibit proliferation induced by recombinant BLyS and by the purified heterotrimers. The mAb against APRIL (anti-A3) did not have any neutralizing activity. These results confirm that the heterotrimer-induced B cell proliferation is not due to the presence of any contaminating homotrimeric BLyS. B cell proliferation assay. 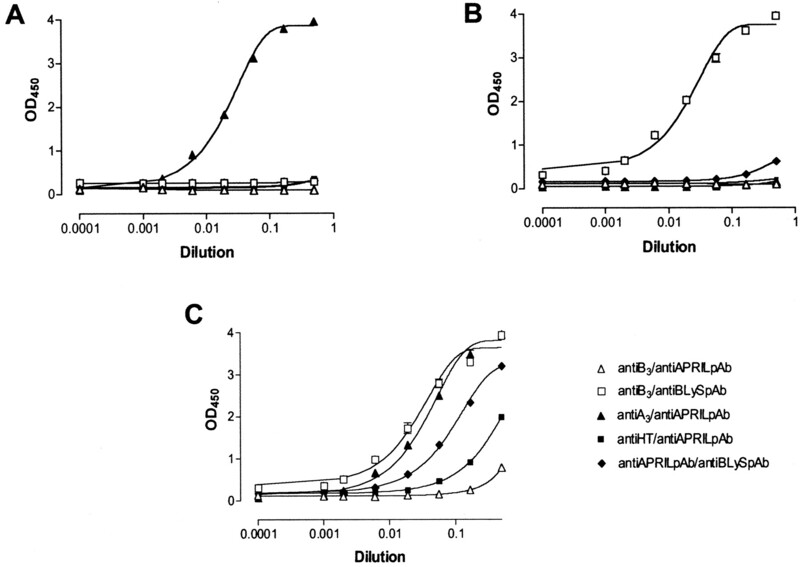 Recombinant BLyS, APRIL, and purified APRIL/BLyS hetrotrimers were tested in a human tonsillar (A) and splenic B cell proliferation assay (B) in the presence of S. aureus cells. After 72 h, cells were pulsed with 0.5 μCi of [3H]thymidine and incubated for 20 h. Thymidine incorporation was used as a measure of proliferation. Human B cell proliferation assay: Ab inhibition. The indicated Abs were tested in a human B cell proliferation assay for their ability to inhibit. A, BLyS- (at 3 ng/ml) induced proliferation; B, heterotrimer- (at 3 ng/ml) induced proliferation. C, Effect of TACI-Fc, BCMA-Fc, and BAFFR-Fc on BLyS- (at 3 ng/ml) induced proliferation. 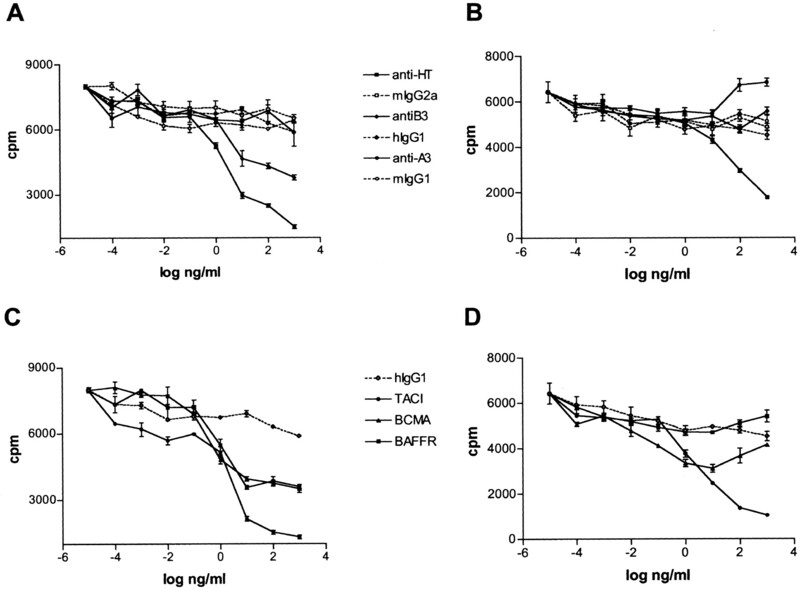 D, Effect of TACI-Fc, BCMA-Fc, and BAFFR-Fc on heterotrimer- (at 3 ng/ml) induced proliferation. BLyS and APRIL are known to share two receptors, TACI and BCMA. A third receptor, BAFF-R, has been recently characterized and appears to be specific for BLyS. To understand whether the heterotrimers would be able to signal through the same receptors, we tested the ability of the Fc-fusion forms of TACI, BCMA, and BAFF-R (TACI-Fc, BCMA-Fc, and BAFF-R-Fc) to inhibit BLyS- and heterotrimer-induced B cell proliferation. As shown in Fig. 6⇑, C and D, TACI-Fc efficiently neutralized BLyS and heterotrimer-induced activation. BCMA-Fc and BAFFR-Fc significantly affected BLyS-induced proliferation but did not efficiently inhibit the proliferation observed in response to the heterotrimer. Similar results were obtained when murine splenic B cells were used (data not shown). Having shown that APRIL and BLyS can form active heterotrimers and having characterized ELISA formats that would specifically recognize this type of complex, we analyzed serum samples from 15 patients with systemic immune-based rheumatic diseases and six normal controls. The diagnoses of the patients included the following diseases: SLE, RA, Reiter’s syndrome, psoriatic arthritis, polymyositis, and ankylosing spondylitis. Two ELISA formats characterized by different capture Abs were used—anti-HT mAb and anti-BLyS pAb—while the anti-APRIL pAb was used as a detecting agent for both formats. In addition to these ELISA formats, the patient serum samples were also tested for A3 and B3 levels (Table II⇓). The average level of BLyS/APRIL heterotrimer found in the majority of normal donors was lower than 0.5 ng/ml. In the samples from the autoimmune patients, the levels of APRIL/BLyS heterotrimer detected were significantly higher (median was 3.11 ng/ml and 32.4 ng/ml using the anti-HT mAb or the anti-BLyS pAb as capture reagents, respectively) than what was detected in the normal controls. The levels of APRIL were also significantly increased in rheumatic disease patients (median level 2.8 ng/ml) compared with normal donors, which suggests that the increase in both APRIL and BLyS expression might contribute to the secretion of heterotrimers. Members of the TNF superfamily of ligands and receptors are known to be important regulators of the immune system. In the past 2 years, a number of studies have focused on the function of BLyS and APRIL as B cell factors (31, 32). BLyS has been shown to be a key B cell survival factor that may be implicated in causing hypergammaglobulinemia and elevated autoantibodies in patients with systemic immune-based rheumatic diseases. This was suggested by the finding that transgenic mice overexpressing BLyS develop an SLE-like syndrome and that patients with systemic immune-based diseases harbor elevated serum BLyS levels that correlate with increased serum IgG and anti-dsDNA and rheumatoid factor Ab levels (14). APRIL has been reported to act as a B cell and T cell costimulator, but has also been described as a proapoptotic factor. In addition to these contrasting effects, loss of APRIL (APRIL−/−) may lead to embryonic lethality and cardiac defects, further suggesting that the principal biological role of APRIL may not be that of a B cell costimulatory factor. The regulation of APRIL in autoimmune diseases remains to be determined. Shared receptor usage among the TNF ligands has been described for many proteins (1). For example, LIGHT and LTα both bind HveA and LTβR, but LTα also shares two receptors with TNF (TNFR1 and TNFR2). In general, all the members of this superfamily have been characterized as homotrimeric molecules, with the exception of the lymphotoxin-α/lymphotoxin-β heterotrimer. Although only homotrimeric LTα has been observed as a secreted active protein, membrane-bound forms of the lymphotoxin-α/lymphotoxin-β heterotrimers are known to bind different receptors and to elicit different biological responses (33). The possibility that shared receptor usage may actually reflect heterotrimerization of the ligands has not been previously investigated. The fact that BLyS and APRIL share significant protein homology, are secreted by the same type of cells in response to similar stimuli, and share two receptors prompted us to ask whether they could form biologically active heterotrimeric molecules. In this paper we show that, when coexpressed, APRIL and BLyS can indeed form heterologous molecules. These, in principle, may be composed of either two APRIL molecules and one BLyS, or one APRIL and two BLyS molecules. Even though we do not have the tools to distinguish the two types of heterotrimers (A2B and AB2) from one another, Abs that specifically recognize the homotrimeric forms of BLyS and APRIL have allowed us to isolate and study the APRIL-BLyS complexes. Using a human B cell proliferation assay, we were able to show that the heterotrimeric material we isolated from transfected HEK 293T cells was active. This heterotrimer-induced B cell proliferation could only be blocked by the mAb that recognizes heterotrimers in addition to B3. In contrast, an Ab that specifically neutralized B3-induced activation had no effect on BLyS/APRIL heterotrimer-induced proliferation. In addition, the Fc-fusion form of TACI efficiently inhibited both BLyS homotrimer- and heterotrimer-induced proliferation. The fact that BCMA-Fc and BAF-FR-Fc had a more modest effect raises more questions regarding the function of these receptors in the context of B cell regulation and survival. Recent reports have shown that BAFF-R may be the main receptor for BLyS; however, maturation-associated variations in BLyS receptor expression (34) suggest that TACI, BCMA, and BAFF-R may play different roles during the various stages of B cell maturation. The fact that heterotrimer-induced signals appear to be more efficiently mediated by TACI suggest that APRIL/BLyS heterotrimers may be active on mature B cells as TACI is expressed at higher levels on mature rather that immature B cells. Inasmuch as APRIL binds cells (adenocarcinoma tumor cells) that do not express either TACI or BCMA, and does not bind to BAFF-R, there likely is an as yet unidentified specific receptor for this ligand. The Abs we have characterized have allowed us to show by ELISA that BLyS-APRIL heterotrimers are present in serum samples from patients with systemic immune-based rheumatic diseases, in some cases at very high levels. The polyclonal format consistently detected higher levels of heterotrimers in the patients compared with the anti-HT mAb capture format. This may be due to the fact that the polyclonal serum recognizes both forms of the heterotrimer (A2B and AB2) while the anti-HT mAb might preferentially bind to one form. In addition, the discrepancies between the two ELISA formats may be in part due to low avidity nonspecific interactions of the polyclonal serum. Larger numbers of samples will need to be analyzed to assess the frequency of patient samples in which heterotrimers can be observed in different diseases and how this correlates to the expression of B3 and A3. Elevated serum BLyS levels have been found in patients with RA, SLE, and Sjögren’s syndrome. Our findings suggest that both homotrimeric and heterotrimeric BLyS molecules may be deregulated in various rheumatic diseases; therefore, analysis of relative levels of homotrimeric and heterotrimeric molecules in samples from patients with different conditions will be of great interest. The biological activity of the heterotrimeric molecules and their elevated presence in a subset of patients with systemic immune-based rheumatic diseases suggests that, for therapeutic purposes, an Ab or a decoy receptor recognizing the heterotrimeric forms of BLyS/APRIL may represent an intriguing alternative therapy in such a group of patients. Moreover, such a reagent may allow to distinguish patient subsets within an autoimmune disease. In conclusion, we have shown that BLyS and APRIL can form biologically active heterotrimers that, similar to homotrimeric BLyS, appear to be deregulated in disease. Our findings further suggest that these heterotrimeric molecules may play a role in the pathology of various autoimmune diseases and also raise the possibility that other TNF ligands may form active soluble heterotrimers. We thank Dr. Gil Choi for large scale transfection preparation, and our colleagues at Cambridge Antibody Technology for providing the anti-BLyS human Ab. We would also like to thank Andrea Smith for assistance with the manuscript, and Drs. Steve Ruben, William Freimuth, and Palanisamy Kanakaraj for helpful discussions. ↵1 This work was supported in part by National Institutes of Health Grant AR41006 (to W.S.) and a grant from the Alliance for Lupus Research (to W.S.). ↵3 Abbreviations used in this paper: SLE, systemic lupus erythematosus; RA, rheumatoid arthritis; scFv, single-chain variable fragment; pAb, polyclonal Ab; A3, APRIL homotrimer; B3, BLyS homotrimer. J. H. Klippel, ed. Primer on the Rheumatic Diseases 12th Ed.2001 Arthritis Foundation, Atlanta.